My son, like many boys, adores trucks. He enjoyed William is Going Green when his sister read it to her, but there is one thing about the story I find a bit awkward. I do think that city garbage trucks should have hybrid motors, but as mentioned in the book, the cost to convert a truck is expensive and not readily available. William’s reward for rescuing a cat is not the solution for most city garbage trucks, and I think it is a little misleading to children who really want to see change. Perhaps there is another way William could have gotten a new hybrid motor from recycling proceeds, donations, gas taxes, etc. Maybe I am too much of a realist, but I like my green children’s fiction to address the realities of environmental change. This part of the story didn’t bother my children at all, and they really did like it. This book is made with 100% wind power and is FSC certified. I truly appreciate the publisher’s efforts to use green practices when publishing a book designed to educate children on environmental issues. 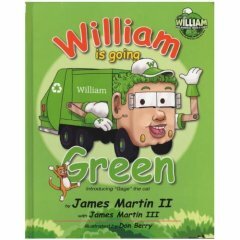 This is the first William book in the series, and we’ll have to wait for the next book to see what happens now that William has gone green. Cute but a bit threatening. To suggest that one would lose their job because they “pollute too much” rings of the wacko left. Since you cannot convince the adults of your global warming lie, you begin to pollute the minds of the children. Shame!